Lace braid is a half-French or half-Dutch braid that runs along either one or both sides of the head. It gets its name from its lacy appearance that helps to frame the face and embellish plain hairstyles. Lace plaits provide the perfect way to bring out the princess in you. They are simple to create, possess undeniable charm and elegance and go well with literally any look. This trendy hairstyle has only recently started flooding the internet with pictures of exquisite variations suitable for every occasion. 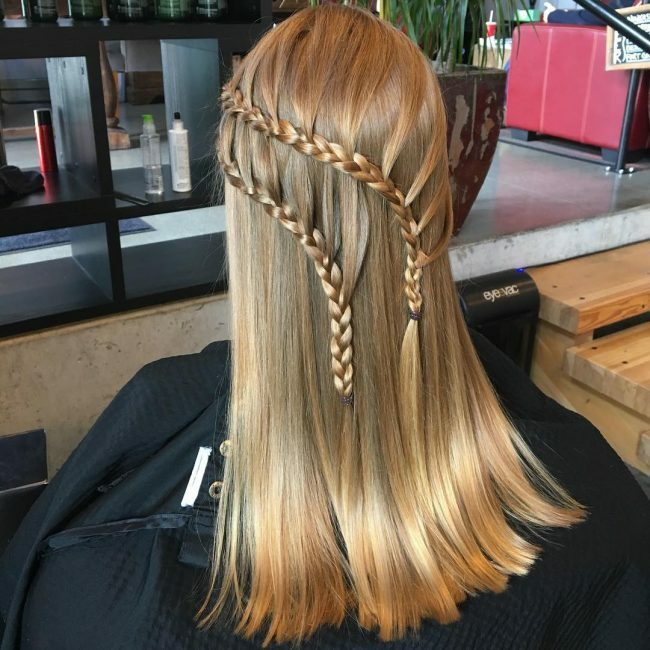 It proves its versatility in the way it can incorporate different types of braiding techniques and use various embellishments to create a truly unique and personalized look. Feel free to be inspired by these 25 creative variations of the timelessly classy hairstyle. The simplicity involved in the creating of this elegant lace plait is not apparent at first glance. The plait is an intricate crossover of a four-strand plait and a light waterfall done on the golden locks. Both braiding styles are simple and look good as individual hairstyles, but they exude a sense of playful elegance when combined. Braid runs across the side and down the back where it finishes in a loose plait tied with a pink bow. This is one very simple look to achieve despite the elaborate nature of the snaking plait. The plsit features a simple three-stranded/traditional plait enhanced using the harp styling technique. This leaves it running across the temple and down the back of the head in an elegant S-shaped plait which ends in a long plait down the back. 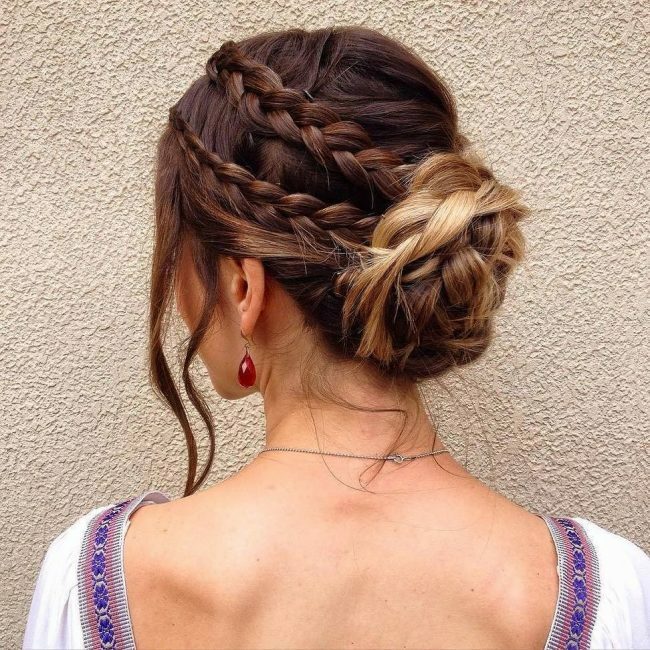 This elegant updo incorporates the playfully feminine nature of a well-placed plait running along the sides and an exquisite braided bun at the back to create a sophisticated updo that is as glamorous as it is unique. 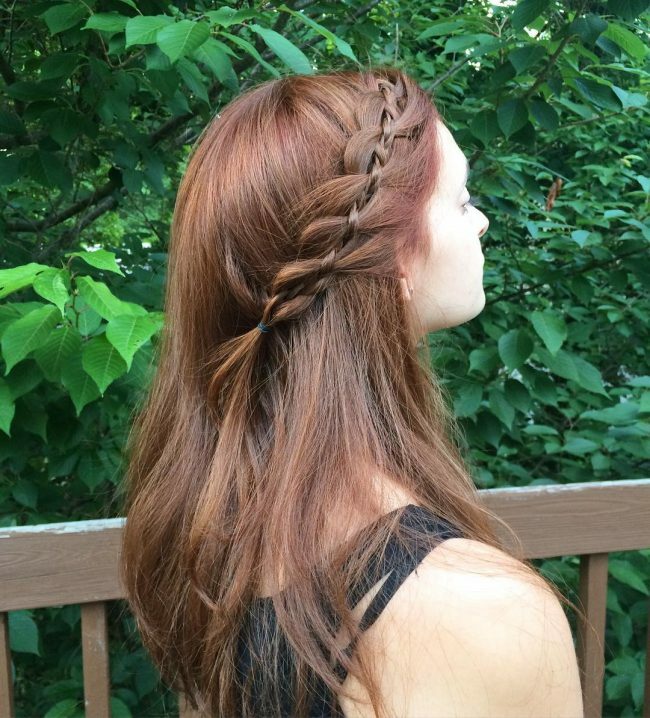 The fiery red hair adds to the appeal of the unique plait variation and it is evident that this is a look suitable for glamorous high-profile events. 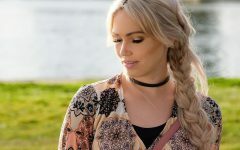 Although a bit bolder than the regular plait, this pretty hairstyle features a loosely done plait running down the side, ending in a simply tied loose plait. The braid is a version of the effortlessly elegant loose French twist and it runs over a parted section of brown locks. It is a simple hairstyle as it only involves one technique, albeit one of the more complex ones. 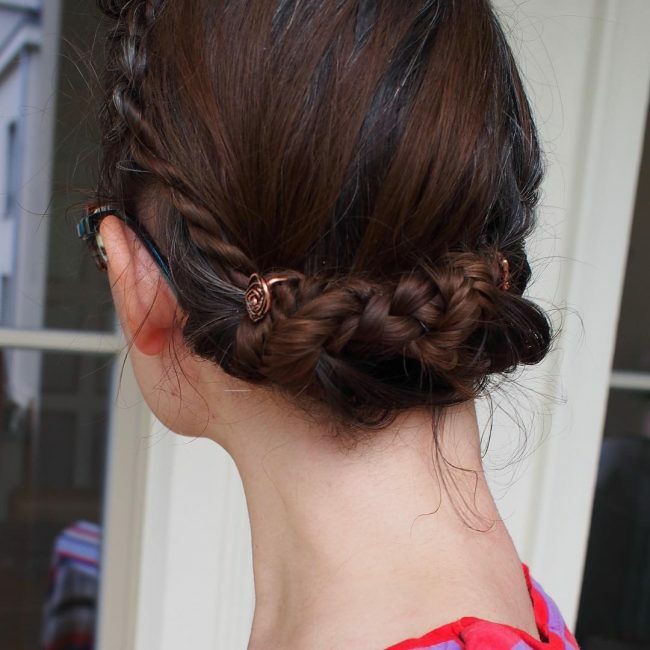 The only thing that looks better than a well-styled plait is two well-styled braids. This hairstyle features two simple three-strand plaits that run along the side and end in a stylish flower bun at the back. Loose strands of hair at the temple give the look a softer, more girly appeal. If you need an embellishment, a nicely placed flower pin will do this look the justice it deserves. 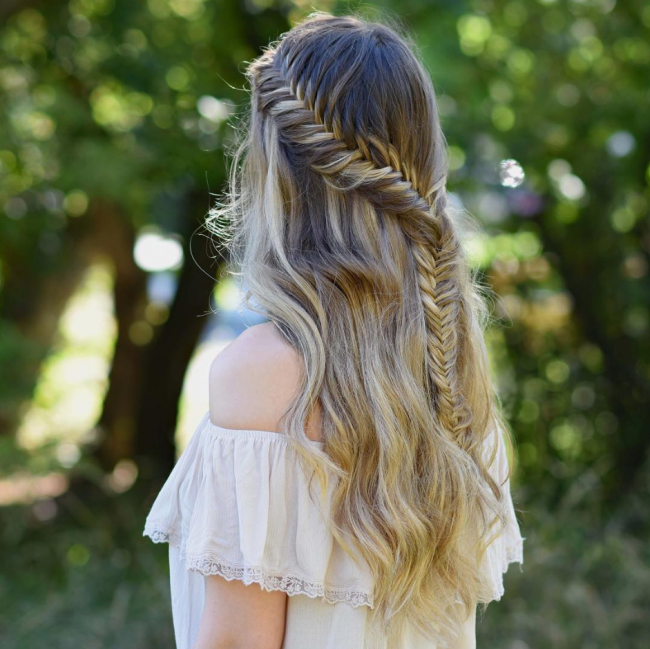 This is a perfect example of how exquisite a waterfall braid looks on well-straightened hair. The lustrous blonde double plaits run across the temple and cascade down the back where they end in loose plaits that blend in with the surrounding locks. 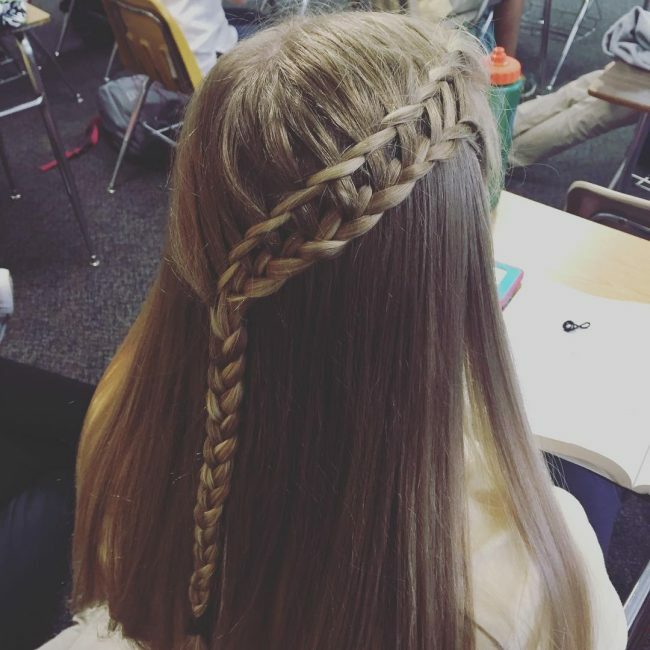 The triple strand braids incorporate the waterfall technique for added uniqueness. 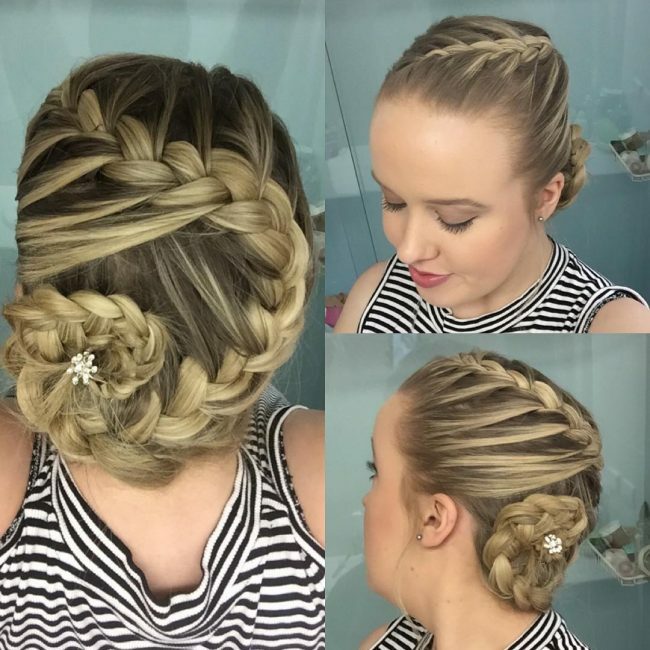 Another perfect example of how creative the design can get is this uniquely styled braided ponytail that features a double strand plait running along its length. The hair is tied into a simple ponytail updo that features a pretty intricate design which takes the classic ponytail look into a new level. 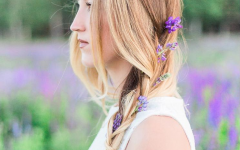 Infusing a bit of color into your plait was always allowed, and this is executed perfectly in this hairstyle. 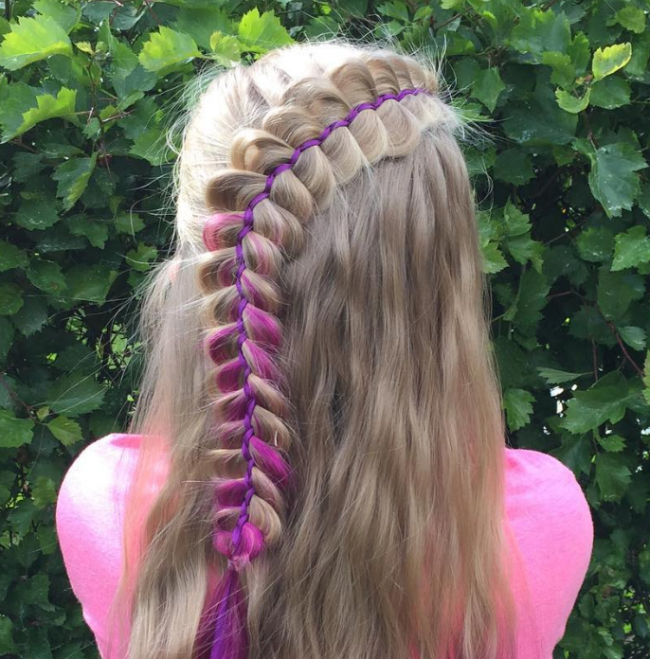 The purple ribbon is braided together with the pale blonde hair into a colorful thick five strand hairstyle running along the side and down the back. The end of the purple ribbon is left loose at the bottom of the plait where it blends in nicely with the purple highlights. 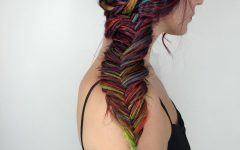 The brown hair is given a nice gradient with the addition of lush rose highlights at the edge of the unbraided plaits. Running diagonally from the left temple to the right shoulder is a simple but beautiful waterfall braid that turns what is a simple look into a trendy look that can be created in minutes. This elegantly styled updo features loose French braids running exquisitely in an S-shape across the head and ending in the back in a wonderful flower bun. Admittedly, this look is of professional standards although when properly motivated, it is easy to recreate the elegant French twists and a variation of the flower bun. The medieval times left us with a few stylish tokens, one of which is this simple milkmaid braid spruced up by blonde highlighted red hair. In true medieval fashion, the plait runs around the head in halo-like design that was traditionally worn by the maidens of the past. Looking at it now, there is nothing outdated about the hairstyle. 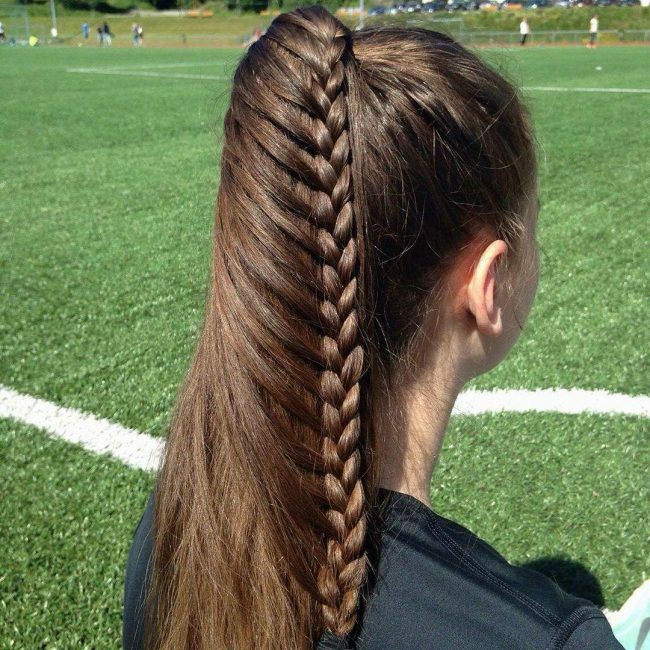 A French plait and a fishtail plait are combined to create this gloriously unique hairstyle. The thick fishtails run along the temples and down the back where they join the cascading blonde locks. 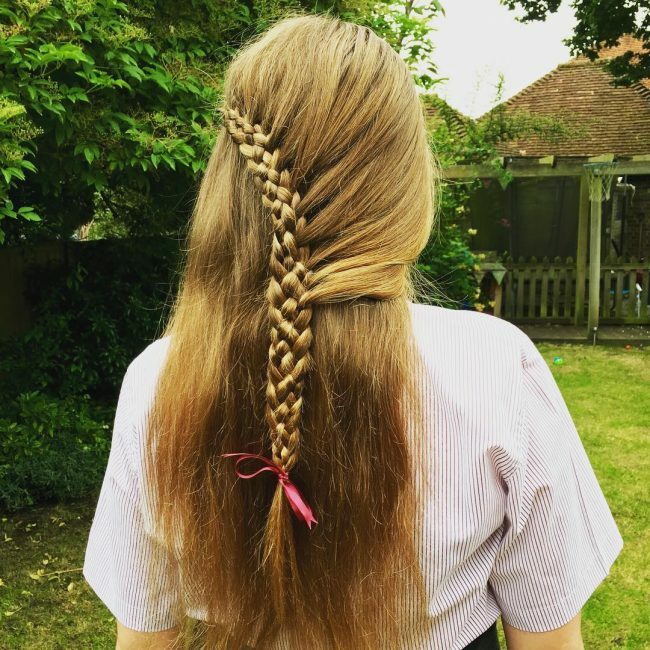 This style features a plait within a plait as the fishtail braids are again plaited into French plaits down the back for a truly unique finish. Yes, this look is inspired by the Game of Throne character Daenerys Targaryen where two double plaits run along the temples and come together at the back to form a simple ponytail. The twists are simple triple strand plaits that everyone can make and they finish in a similarly simple ponytail. However, it is safe to say that it is a look fit for a queen. Once again, the plait within a plait hairstyle stands out in its uniqueness and its ability to become a bold fashion statement. The fishtail braids run across the temples and end in an elegantly plaited French plait updo at the back with bronze hairpin embellishments. The hairstyle is perfect for short to medium-length hair and can be worn on formal occasions. 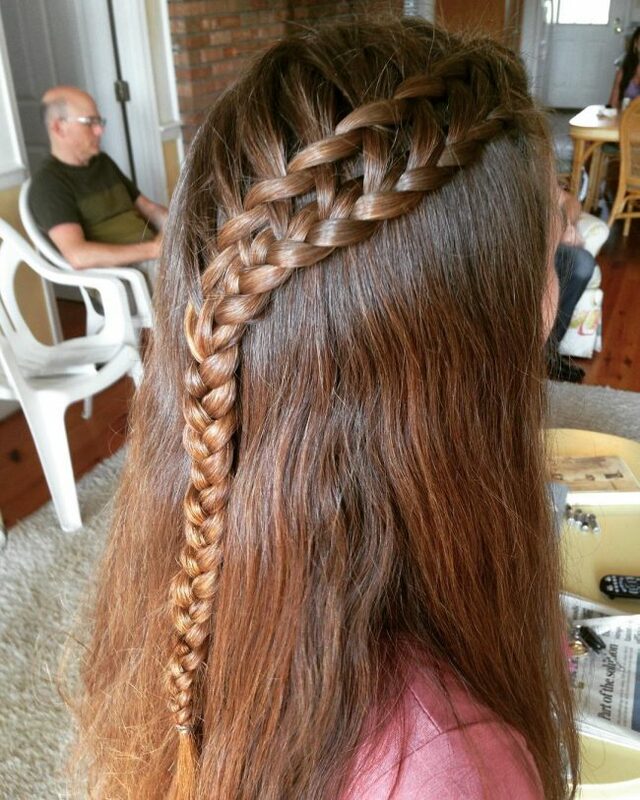 A ladder braid is considered a basic braiding technique although there is nothing basic about the way it looks. The intricate pattern of the ladder plait looks sophisticated even when done on straight hair without any embellishments. The red-haired ladder braid morphs into a simple three-stranded plait down the back where it ends in a loose plait. Elegant is the word that comes to mind on first glance of this exquisite braid combination. 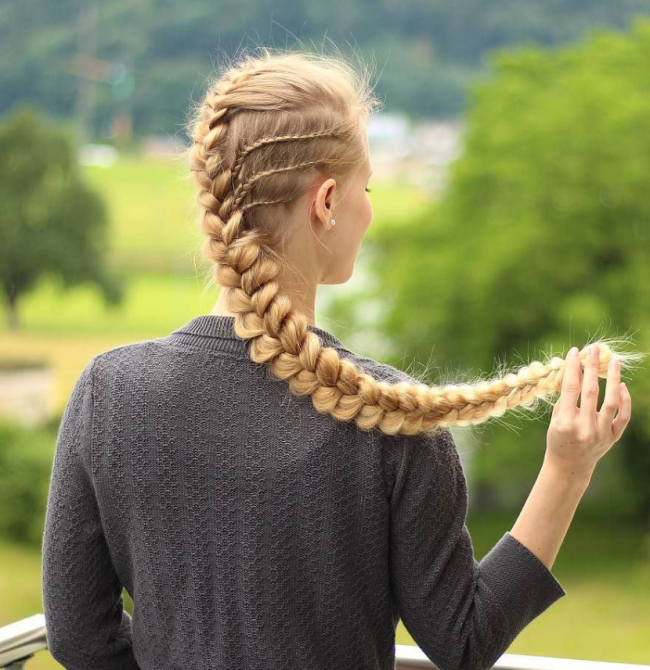 The plait starts high on the head, just after the crown, and cascades in a single ravishingly beautiful and long blonde plait that runs down the back. The sides are pulled into cornrow braids that join the main French braid at the back, making the look one of the most sophisticated variations of the Mohawk you will ever come across. 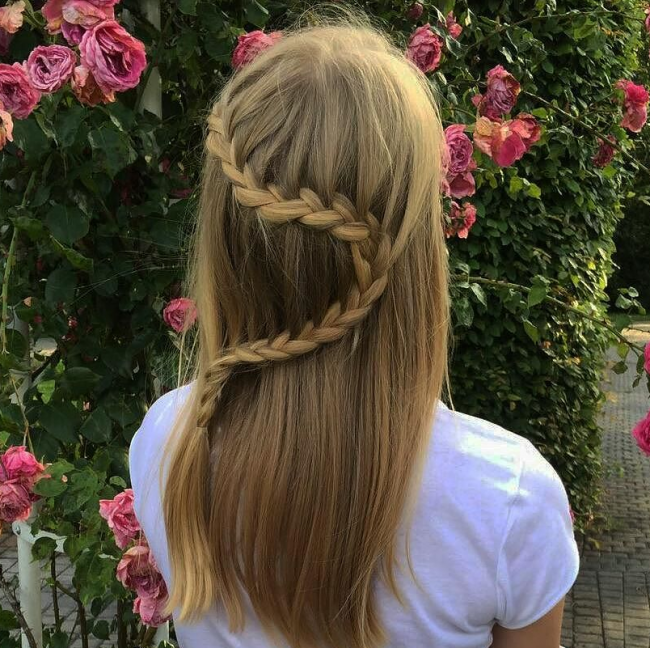 Simple but pretty, this hairstyle features two thin Dutch braids running parallel down the back of the head and ending in tied plaits that blend in with the rest of the locks. The hairstyle looks great on the golden locks by itself but you can spice it up with a colorful bow or hair pin for added uniqueness. This hairstyle takes a lot of patience and practice to achieve. 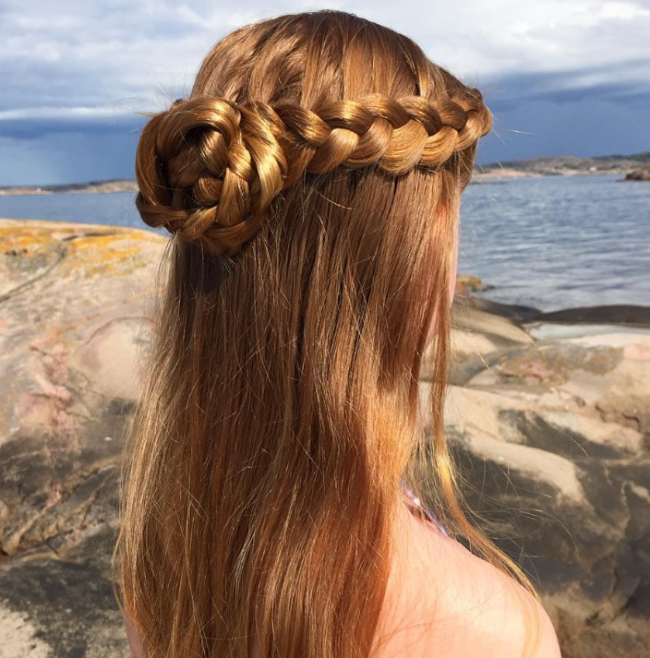 It features five well-done Dutch plait —two of which circle the head in a halo-like fashion—that are then twisted into one large and elaborately styled Dutch plait that runs down the back of the head. 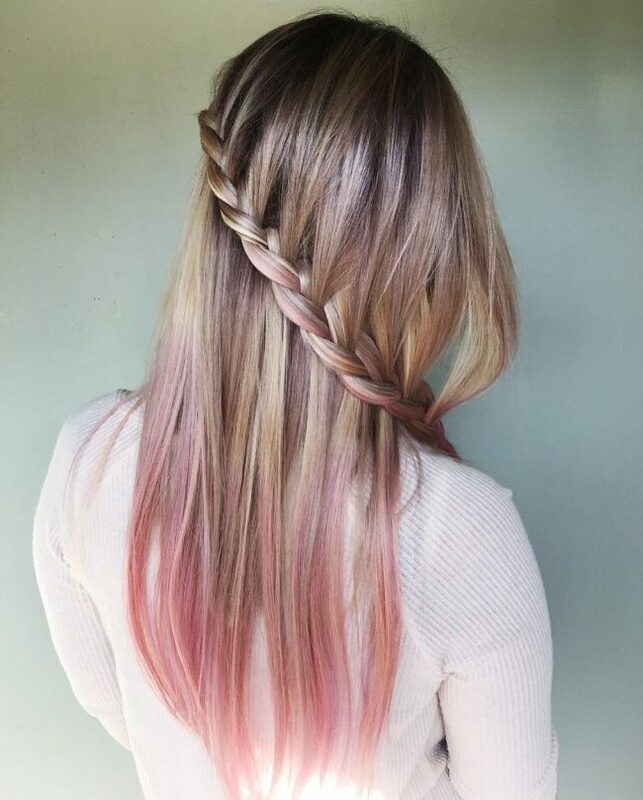 It gives hair a voluminous look with the combination of large and small braids making it one of the most unique hairstyles you will ever see. 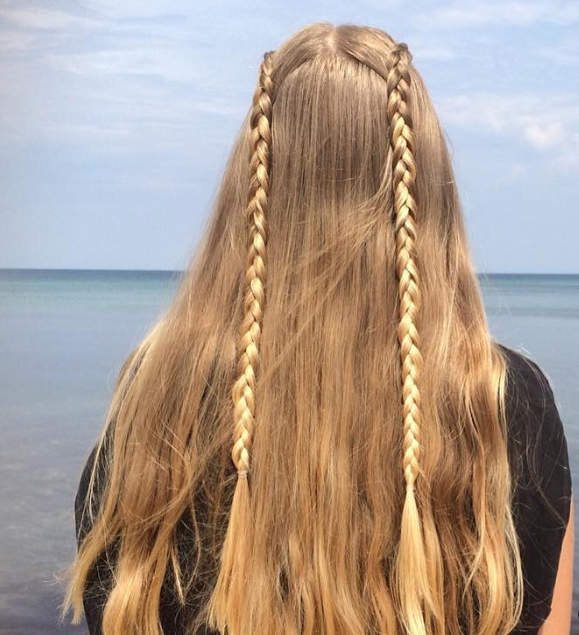 The two braiding techniques blend well to create a uniquely styled hairdo that runs along both temples and ends in a three-stranded Dutch braid running down the back. The straight hair accentuates the elegant plaits by much, as they add simplicity and a contrasting appeal to the intricately combined braiding styles. 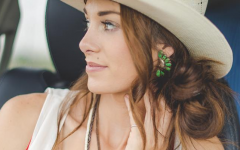 Rope braids are a great quick fix for plain hair. 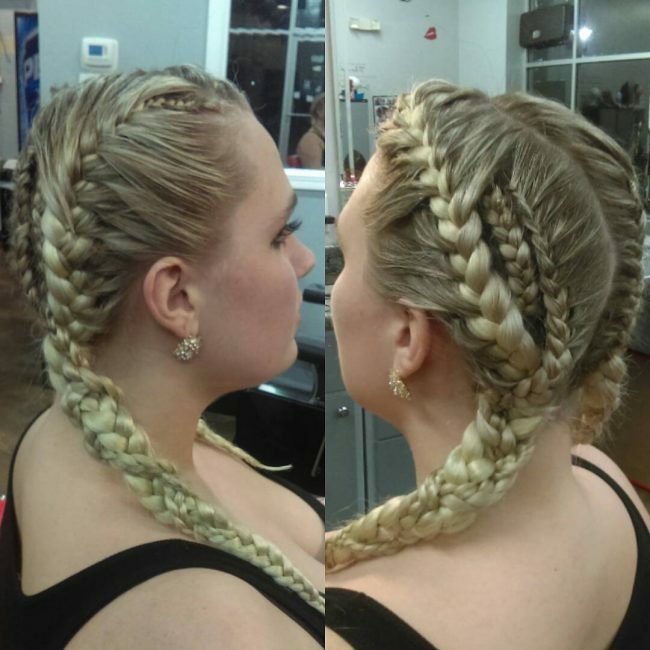 The plaits are achieved by a simple twisting and twirling technique that is easy for anyone to do. The lace braids in this example start on the temple and come together at the back where they are rope braided in an elegant fashion to create a timelessly appealing look. 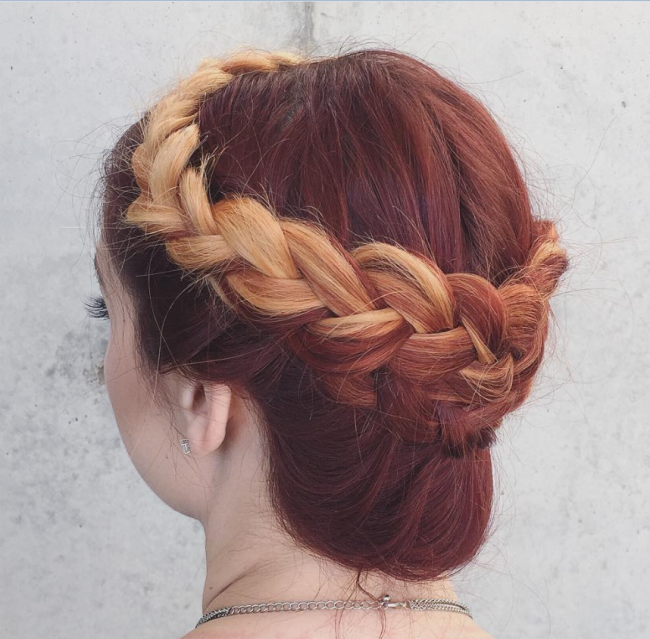 This look creates the impression of a crown of plaits atop the lustrous flowing red hair. 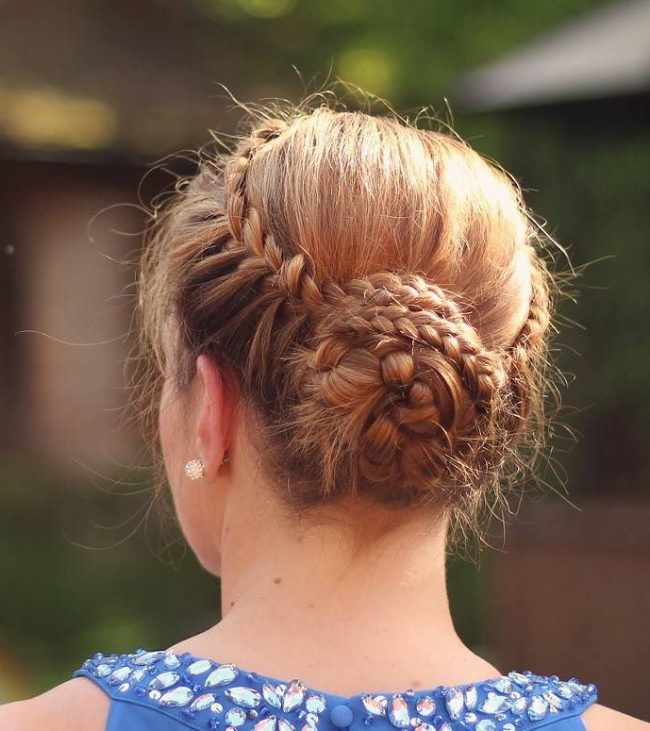 The thick Dutch braids run along the sides and end in a complex braided bun at the back of the head. The look exudes an almost angelic appeal and is great when paired with long, flowing sun dresses for a casual look. 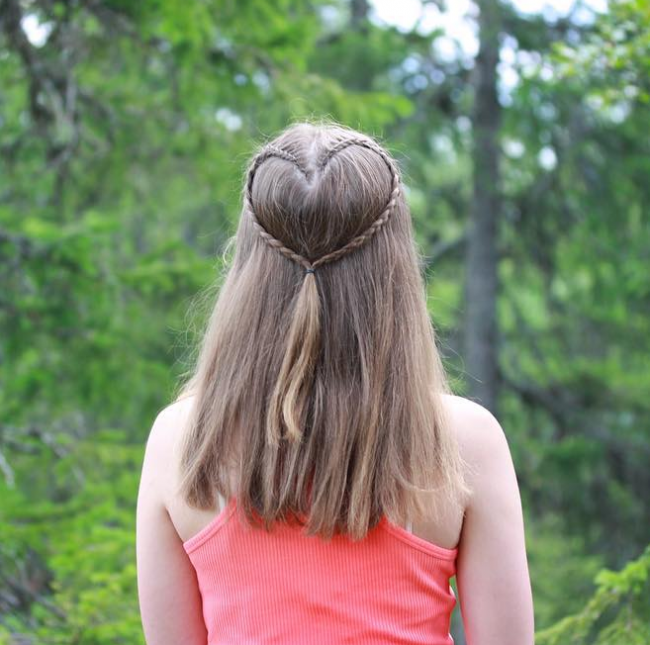 This variation of the lace hairstyle features two normal braids shaped to form an adorable heart shape at the back of the head. The plaits are tied where they meet then let loose to become a long plait down the back of the head. For a playful summer look, it can be paired with brightly colored flowers or other embellishments. The crown features a blue hair piece used to join the two braids running down the temples and down the back in an elaborate thick braid. Although simple, this look needs your patience as it takes a while to end up with such a finely plaited hairstyle. 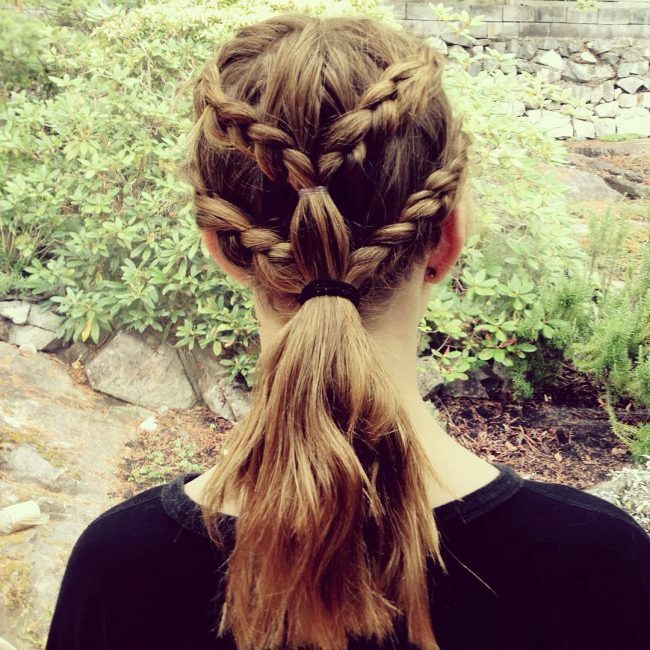 With braids, simple is never dull and this hairstyle just goes to show for it. 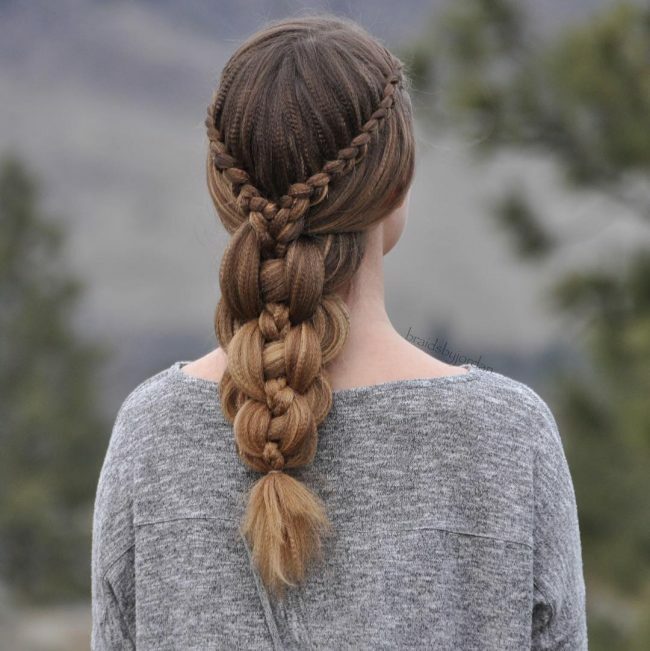 It features a wonderfully plaited bun that is easy enough to do if you are already familiar with a few braiding techniques. 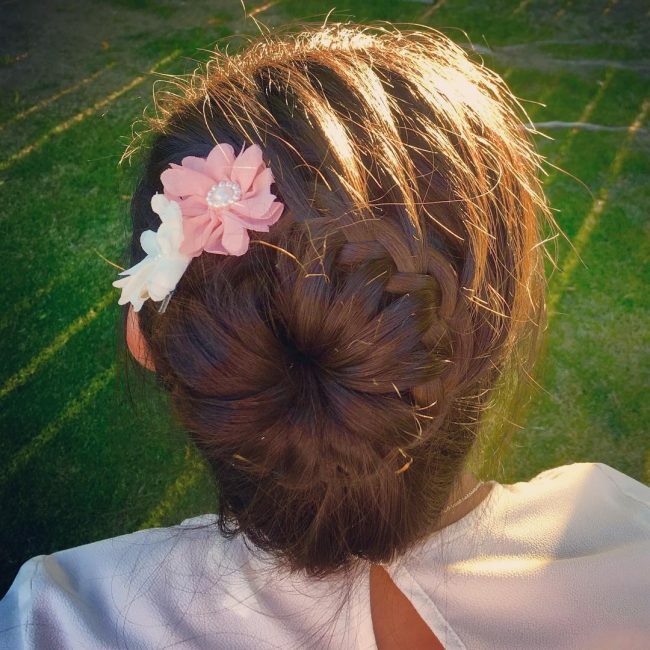 A pink flower pin injects feminine essence into the trendy yet simple hairstyle. 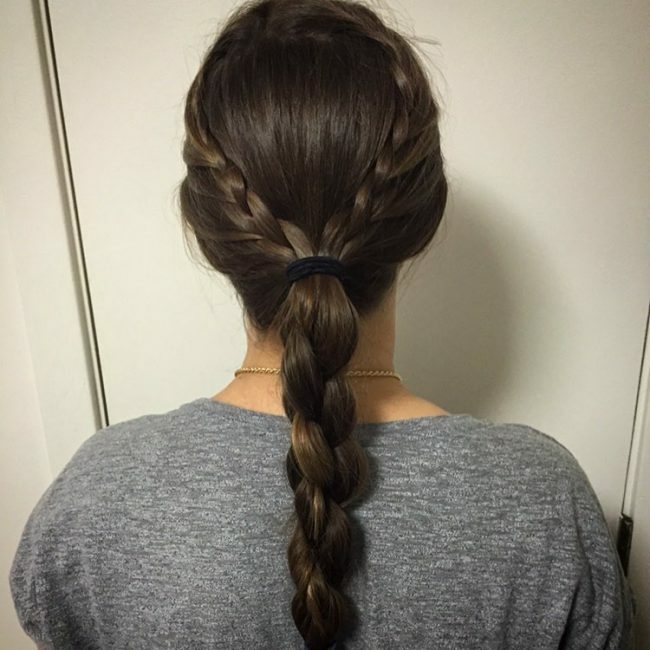 This is one of the bolder variations of the braiding technique as it features multiple plaits that come together at the back to form one long French plait ponytail. The blond hair is parted in the middle with three plaits on each side that leave the crown and the back of the head showing the nice parting line. It is a hip look for the audacious at heart. These examples are in no way exhaustive of the number of different variations you can use to style your hair for different occasions. 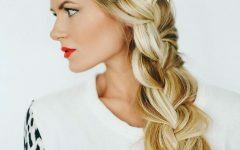 The best part is that once you learn a few of the basic braiding techniques, the power to create exquisite hairstyle in a matter of minutes will be in your hands. 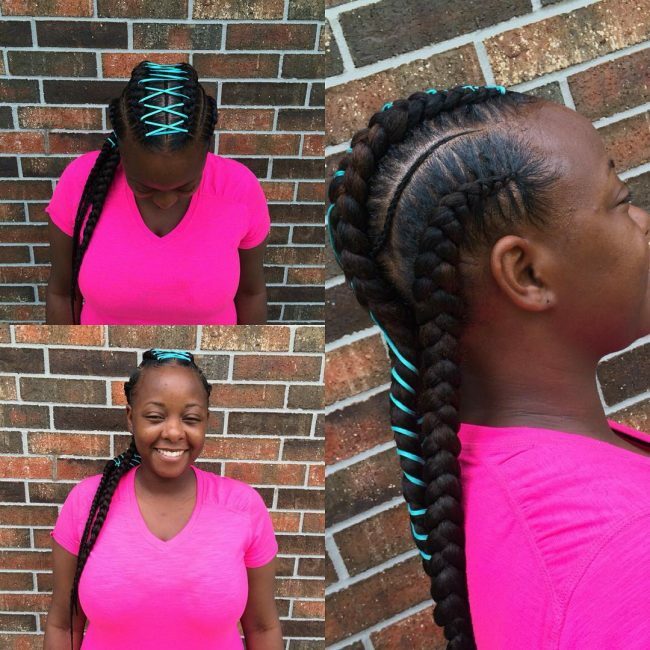 Be on the lookout for more stylish versions of the lace braid hairstyle.